MONTEREY, CA - Conceived on a cocktail napkin and seen in winner's circles from Long Beach to Le Mans, Corvette Racing's skull mascot will have star billing at the Monterey Sports Car Championships at Mazda Raceway Laguna Seca on Saturday, Oct. 20. Affectionately known to the team and Corvette enthusiasts as Jake, the skull mascot will adorn the Compuware Corvette C6.R race cars in full-body graphics for the four-hour season finale of the 12-race American Le Mans Series. With the GT1 manufacturer, team, and driver championships clinched, the last race of the season will be a celebration of Corvette Racing's success. "We wanted to do something special for Laguna Seca, and the guys on the team are totally behind Jake," said Corvette Racing program manager Doug Fehan. "He's a little edgy, urban, and underground. Young fans get it. The special Jake cars are a one-time only deal, just for fun, to make the last race of season memorable for the fans." The skull mascot is the brainchild of designer Eddie Jabbour of Kick Design. His iconic image has been popularized on the badboyvettes.com website. "Jake is the unofficial official mascot of Corvette Racing," Jabbour said with a laugh. "He really came from the team. I was at the 24 Hours of Le Mans in 2004 and noticed that the team had adopted skull icons as a symbol of the 'take-no-prisoners' mentality of those intense 24 hours. In fact, someone had scrawled 'TAKE NO PRISONERS' on the wall of the Corvette garage. "I thought it would be awesome if there was an icon that truly belonged to Corvette Racing. I scribbled the Corvette flag on a cocktail napkin, then drew a skull around it. I thought the design worked, and the team embraced it immediately. "Jake first appeared on the cars at Le Mans in 2005," Jabbour recalled. "Soon he was on the team uniforms, their travel shirts, and on the drivers' helmets. It was in sync with what they were about, and the fans recognized that. Now people are flipping out that there are going to be two Jake cars at the last race." While the tongue-in-cheek Jake tribute is just for fun, there is still the serious business of a four-hour race on the roller coaster Laguna Seca circuit. "We're not taking this race lightly," said GM Road Racing Group manager Steve Wesoloski. "The drivers and crew for the No. 3 Corvette C6.R have something to prove after getting knocked out early in Petit Le Mans at Road Atlanta, and they're going to be pushing hard to end the season on a high note. Oliver Gavin, Olivier Beretta and the No. 4 Corvette crew have wrapped up the drivers championship, but they have pride at stake and they're certainly not going to coast." "We'll push to be faster than we were a year ago," he continued. "That's been our goal at every race this season, and I think we'll see strong competition between the two Corvettes." That intramural competition will also be evident in the final round of the Klein Tools Pit Crew Challenge, to be held on Friday, Oct. 19. The decisive round, which will award $20,000 to the winning team, will see the No. 3 Corvette C6.R, led by crew chief Dan Binks, and the No. 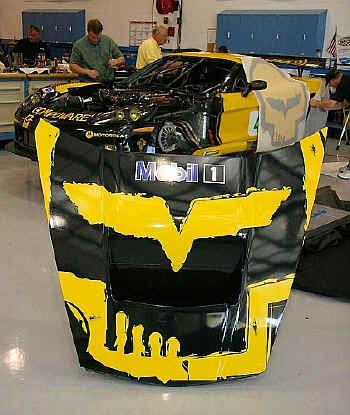 4 Corvette C6.R, under the direction of crew chief Ray Gongla, take on the Nos. 16 and 20 Porsche prototypes of Dyson Racing. The two Corvette squads intend to take no prisoners - just the way Jake likes it. The Monterey Sports Car Championships, the final round of the 12-race ALMS series, will start at 2:43 p.m. PT on Saturday, October 20. The four-hour race will be televised live on SPEED Channel from 5:30 to 10 p.m. ET.